Is this it? Is this our time? Is it time for the modern house to break into the mainstream of American housing? The whole internet is slow on a Friday night so its a good time to ruminate. I often reflect on the state of our remodern movement as I've come to call it. Is this the time? Will modern houses break into the mainstream, finally? Will this be the time when everything changes, and anybody who wants to buy a house, build a house, will have modern as one of their legitimate choices? A builder, or real estate agent - heck, your friends and family even - won't think you strange for wanting a house that is not (pseudo)traditional. I want that change, I'm working for that change, I know many others who want that change, and many others working for that change. And I see change, lots of it of late, new modern houses being built and shown on the internet, new modern developments being offered, modern prefab houses conceived, offered, sold, and built. A lot has changed, a lot has happened since I became convinced to pursue change, oh, around about 2001. And why? What is it that I want from this? What is it that you want? I simply want it to be easier to get the kind of house I like. 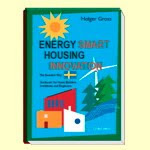 Yet, it certainly has not happened yet - "it" being the sea change that would bring modern houses into the mainstream of choice. As far as things have come forward in the past few years its clear that there is still a long way to go. 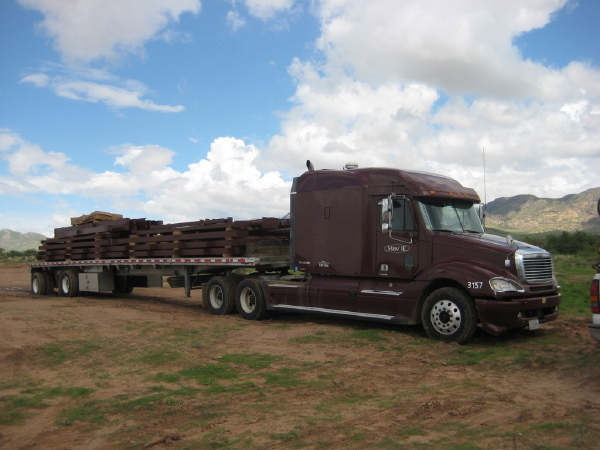 Prefabrication had a run up of popularity, at least as an idea. 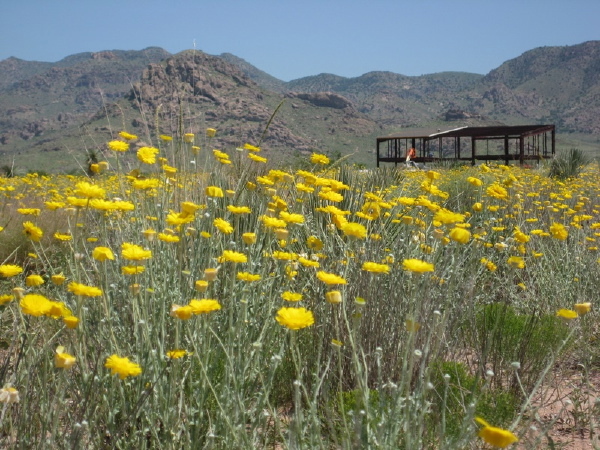 Articles expounding on the new generation of prefabs, notably modern, appeared in different print publications across the country, and online as well. Several of these products have taken hold and are producing houses in numbers the likes of which have not been seen since the 1950s. Some of these products have certainly been more successful than any past run at prefabrication by an architect with a revolutionary plan. But yet we are not there yet. Modern is not being served up for breakfast along side your corn flakes just yet. Other conditions have changed as well. The housing market is reeling from the biggest run-up of values and demand most of us have ever seen in our life times. The talk of bubbles bursting has certainly come true, and we are already witnessing the fall out on associated industries as lenders shrink their work forces, some hammered by defaults. There must certainly be a softening of construction costs along with this burst market. Many builders and subcontractors who were gainfully employed by large corporate developers are now on the street competing for other work. 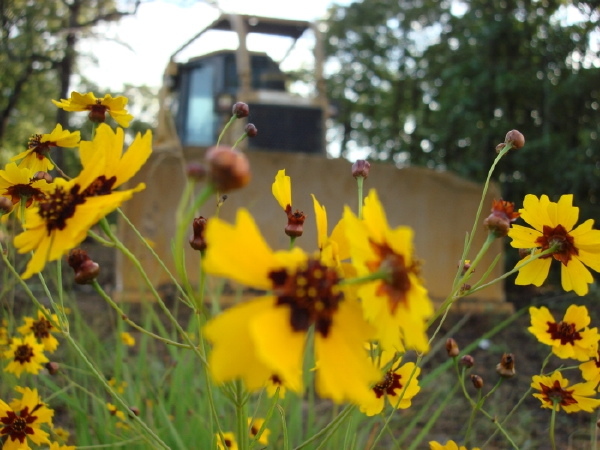 Developers have greatly reduced or stopped building the status quo houses which are the mainstay of their business. Yet, the just emerging voice of the un-served demand for modern housing is still growing, still looking for product, still largely unserved. Does an opportunity lie here? Could some forward thinking developer decide to serve this market, and enjoy some growth in contrast to the retreat of the housing market in general? Could many individuals who were seeking to build their own modern house now suddenly find themselves finally able to build aided by the softening of prices - is this the break that they have been waiting for? Could other developers take note of the growth in this segment while the rest of the market retreats, and then too attempt to serve it? Might this growth expose many others to the modern house, people who never considered it before, adding more to the numbers of unserved demand? Can we tip the circumstances in our favor in this context and get the modern house's foot in the proverbial door of the market? I ponder this. Will it never happen, or is this the time. I finally got around to reading The Tipping Point by Malcom Gladwell, an interesting book on the phenomenon of social epidemics. Its about the point when an idea catches on and spreads like wildfire. When things change suddenly for no obvious reason, when the rate of change is suddenly exponential. Epidemics of disease behave similarly, and hence much of the terminology is interchangeable. In writing about it he has said it was his hope to give people the tools to start their own positive epidemics. Its certainly not a how to manual, but it is a competent attempt to form his observations of common patterns into a framework, if not a formula. Could we bring that to bear on this situation? If the context of the market right now is favorable to an expansion of modern housing, then what else can we do to hasten its adoption, or simply awareness? I can't repeat the entire book here, nor am I advising everyone to go out and read it. But at least have a read through some of the authors comments at his web site, and a look at the outline from wikipedia. In brief, he advances that small things can bring about big change. He observes people who assume different roles in this process - Connectors, Mavens, Salesmen - I won't explain them as a breif read of the wiki site is a good start. Are you one of these? Could you be? He observes a few concepts that are common - It only takes a few of the people with these skills to tip something, ideas must "stick", be meaningful to people in order to tip, context strongly influences our behavior (and sometimes small changes in context beget large changes in behavior), group size is important for the coherence of ideas, the epidemic cycle follows the bell curve (our current readers no doubt at the lead of the curve). As I read this book my mind keeps returning to our re-modern movement. We have people acting these roles, we have a sticky idea which many people are very passionate about, we have a context that has shifted to favor our goals. What can we do to hasten the tipping? Be a Connector. Let the people in your life know about your preference for a modern home. No, you don't have to go around like some freaky cult member. Just wear your preference on your sleeve. Post a photo of that to-die-for modern home from Dwell, or Atomic Ranch on your office wall. Get a coffee mug with a modern house on it. Carry your Modernism magazine around with you. 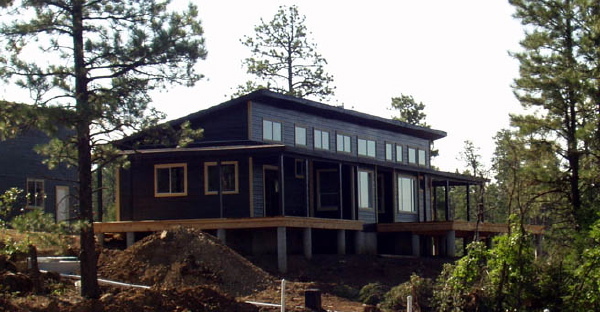 Write about your preference in your blog and link to your favorite modern houses online. 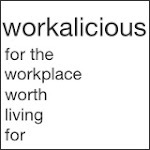 Be ready to lay bare your enthusiasm when a curious co-worker or friend asks you about it. Be a Maven. Do you dig into the very last detail of things you are into. Do you have the earth friendly HVAC system of your dream home planned out in your head, and you know where to get the best price on the parts? Be a materialicous, or a Future House Now. These are people just like you that put their obsession to work for all of us. Even if you think it may be an obscure dimension of what the whole picture is about I can assure you that your blog about everything to do with your modern kitchen sink will have hundreds of passionate followers. Be a Salesman. Are you a leader in what you do? Do people follow your lead because of your work, or your social circle, or your volunteer activities? Bring some of those skills to bear on the modern house. Be an organizer of a modern house meetup group. Get tours going to visit modern projects in your region, get others from different parts of your life to sample this and see what its all about. I'm not saying that this will make it happen. But I know it won't happen if we don't try to make it happen. I'm pulling for your future house - yeah, you over there reading at work, and you in the kitchen, and I'm pulling for your future house, yes you with the iPhone. I want you to pull for his house and her house too. Now get to work. Continue reading "Our remodern movement - the tipping point?" I try to restrain my enthusiasm for the progress on the many projects posted here on the blog. I can't endlessly be hyping every project each step of the way. I love the stuff being built, but I don't want to be a complete salesman about it. But today I have to throw that out the window today because this observatory is just awesome! I know, its not a house, not everybody is going to have one, nor even want one. But because this is outside of the scope of the housing issue is why I feel so enthusiastic about it - this is just fun! 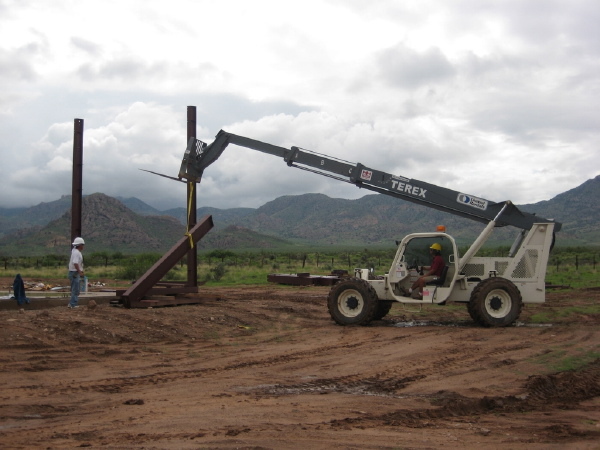 So, ok, today we have pictures of the observatory frame going up. I'm going to post a few of my favorites, and then post the gallery window to the Flickr photostream. Jump over to Flickr if you want to see larger versions of the images, and also I've captioned the photos for a little bit more insight as to what you are seeing in each one. Here is the frame of the observatory drum going up with the house and garage in the distance. And here is the frame complete, the form just as in the earlier renderings, its very nice to see it standing. More photos after the jump. 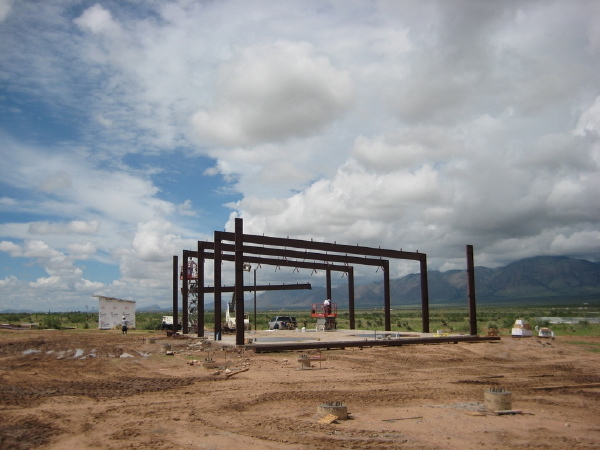 Continue reading "New Mexico EcoSteel House - observatory frame build"
Continue reading "Colorado Plat House - siding stained"
The concrete slab for the second floor of the house was poured on Friday. The owner has sent photos of the process. Photo browser after the jump. 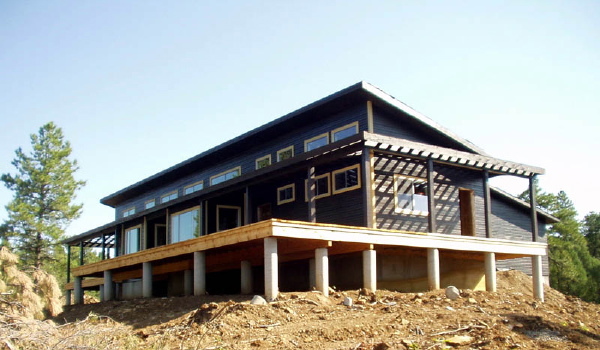 Continue reading "New Mexico EcoSteel House - time to do the concrete"
I got a few more photos of the Vermont Plat House from the owner last week. Its done! Well, I'm sure there are loose ends, but for us here its done. Not the last we will see of it, I'm sure. There is still the small pond house to be built. I don't expect that to be soon, but no doubt we will see some more of the house as well when it happens. The house has turned out very well, indeed, beyond my every expectation. The owner has been outstanding, and tremendously generous with the photos and inside info he shared throughout the process. My thanks go out to him and my other customers who have done the same. 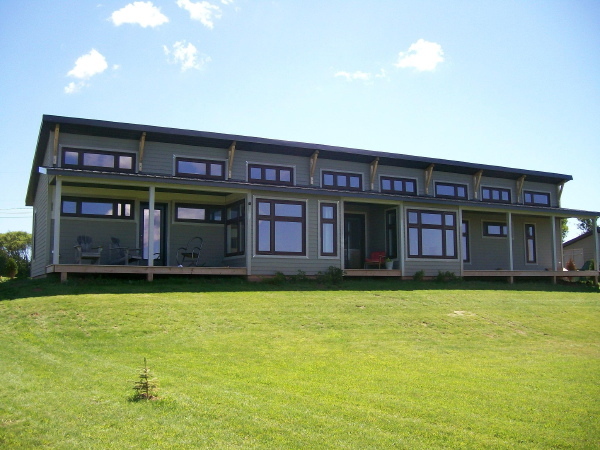 Continue reading "Vermont Plat House - calling it done!" Today, and yesterday for that matter, the second floor joists and deck were installed clearing the way to finish the wall framing. There are a lot of photos of the second floor deck in today's photo stream after the jump. Also some close up images of some of the steel connections, which if like me you love steel details this is yummy eye candy! 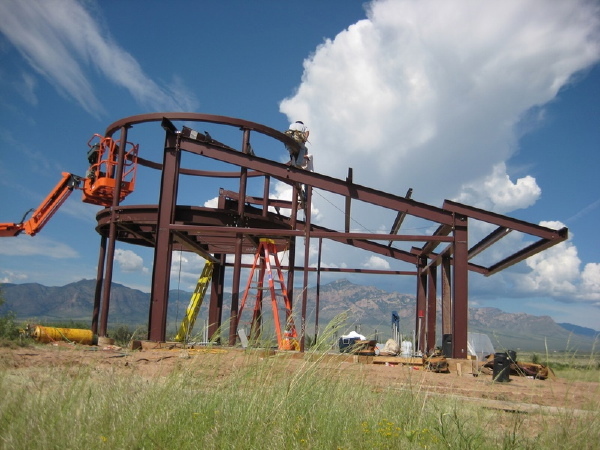 Continue reading "New Mexico EcoSteel House - the second floor"
The house is the focus of progress today. Roof panels are going on, and we even see the slab of the observatory poured. I am going to simply post the link to the Flickr photo stream today so you can access all the photos I've received. But I'll comment first on what you will see. There are some detailed photos of the installation of the roof panels which should be interesting to anybody that likes the nuts and bolts of building. 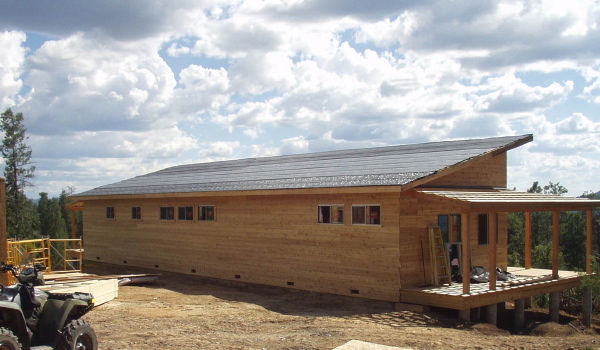 The roof panels have a practical length limited by transport and handling, so the roof of the house has a lap seam halfway. In several of these photos you can actually see the entire process of prepping and setting the panels at one of these joints. Also a word about the sequence. At the garage you will remember that all the wall sub-framing went up prior to the roof panels beginning. Over at the house they have not put up any of the wall sub-framing, yet the roof panels are underway. This is because they are expecting the floor joists and they will need open access to the interior of the house to maneuver the joists, so the wall framing will follow. Photos after the jump. 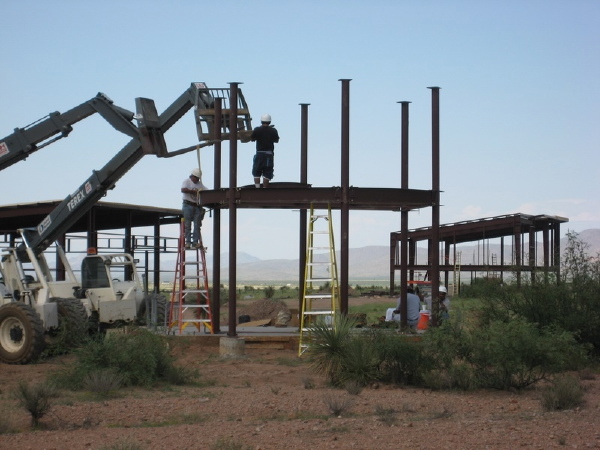 Continue reading "New Mexico EcoSteel House - more photos from Friday"
Continue reading "Spring Creek Design wants to build your LaMiDesign house"
If a photo of a steel house being built is worth a thousand words, then a video is probably worth a million. The owner shot this time-lapse sequence of the days build with his digital camera, and assembled them into a short video sequence. You can see the house frame going up on the left side of the frame. The build sequence laid bare! Follow the jump to the rest of the post to see the short video. If its not playing for you here you can catch it on YouTube as well. 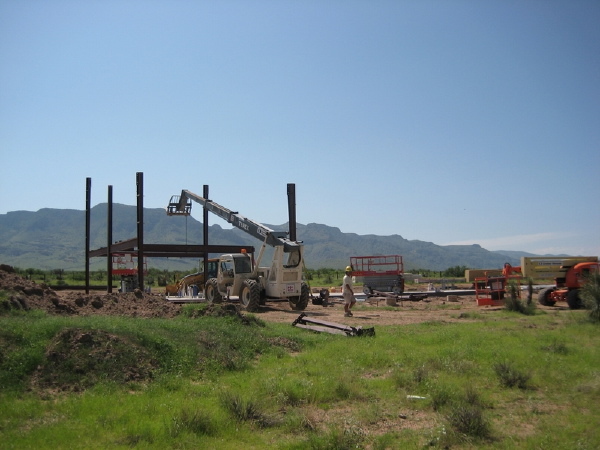 link Continue reading "New Mexico EcoSteel House - build day video"
Several days have passed and progress has been made on the garage, and the house has begun to rise. Once again I am going to use the Flickr photo stream to post everything I have received from the owner. There are several different activities you will see in the photos. First off the house frame is starting to rise. Like the garage the first part to stand up are the columns of the main frames. 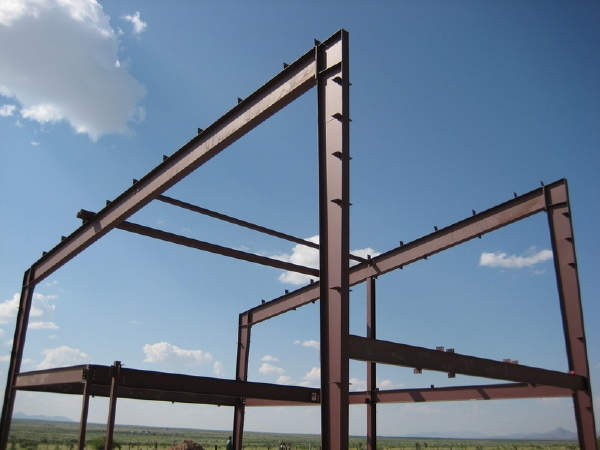 These are set on their anchor bolts and the main roof rafter beams are attached to them. They have all the columns in and appear to be starting the horizontal work on one end and working across. At the house there is an intermediate beam which supports the second floor, and you can see that in the images of the frame. You will also see that there are roof panels on the garage already. 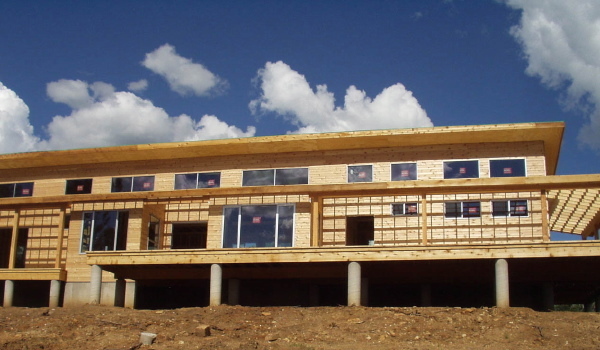 The wall panels will follow, but the windows must be installed first. In any case the roof is on the garage and its making shade! 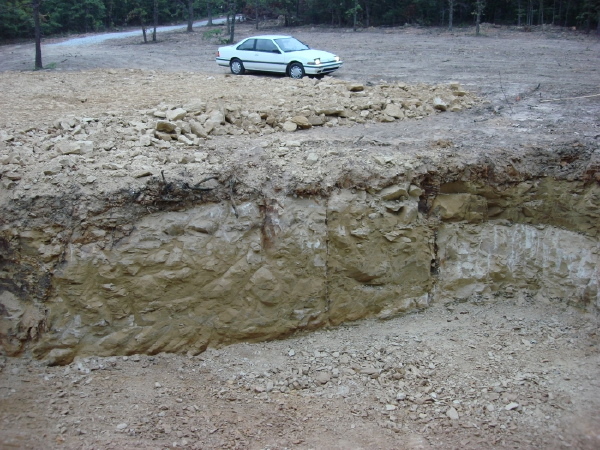 And you will find the first images of the layout of the foundation and slab for the observatory. We also have included a few astronomical photos from the owner. The first is a photo of a meteor caught on the night of the Perseid Meteor Shower. They say when this event is a strong one there are so many meteors you can get a sense of the planet hurtling through space! The second is a photo of the Zodiacal Light, which is an omnipresent but rarely observed phenomenon whereby the low level of sunlight reflected back at the earth from cosmic dust is a visible glow near the horizon. Make sure to click through to Flickr to see the full res on these images. Photo browser after the jump. 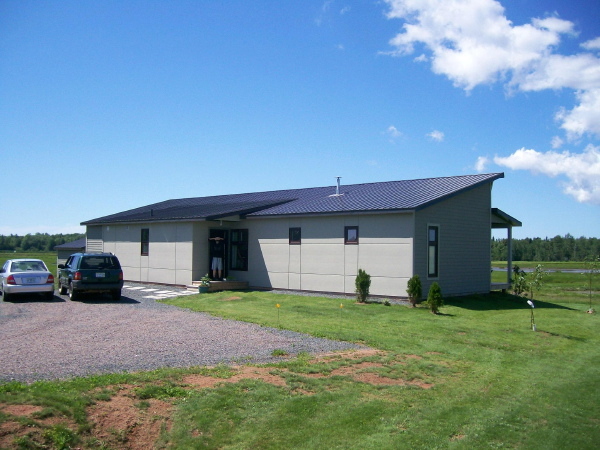 Continue reading "New Mexico EcoSteel House - the house begins"
Last summer we showed photos of a Plat House under construction on Prince Edward Island (PEI). Today we received some photos of this house complete. Here is the rear of the house facing the water. You can see some of the changes designed by PEI architect Ross Macintosh here. The size of the windows have been reduce to suit the climate, and the side cantilevered overhangs have been reduced as a concession to snow load. And the entry side of the house. They increased the house to 3 bedrooms with little increase to the footprint. 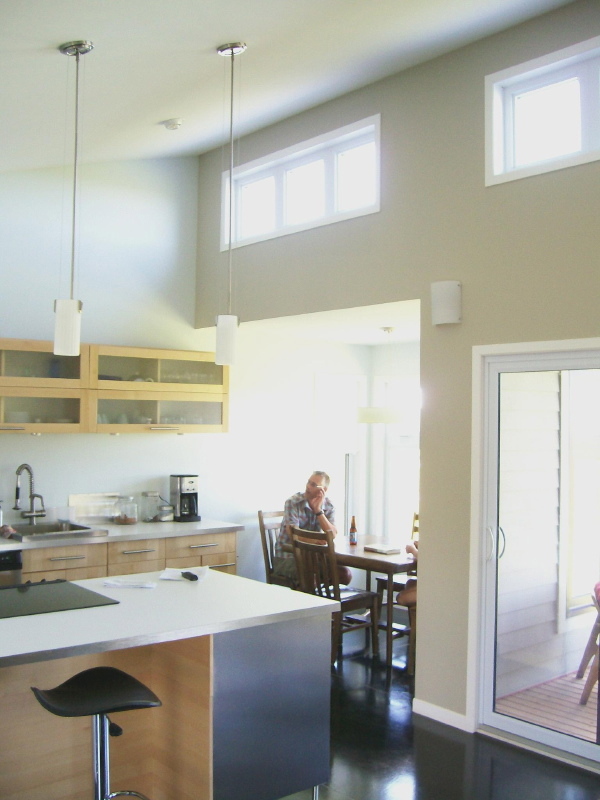 This entry area was part of the increased floor space that allowed the shift to 3 bedrooms. And here inside at the kitchen - they have wonderful concrete floors, and the north light is fantastic. Much thanks to Ross for forwarding these updated pictures. 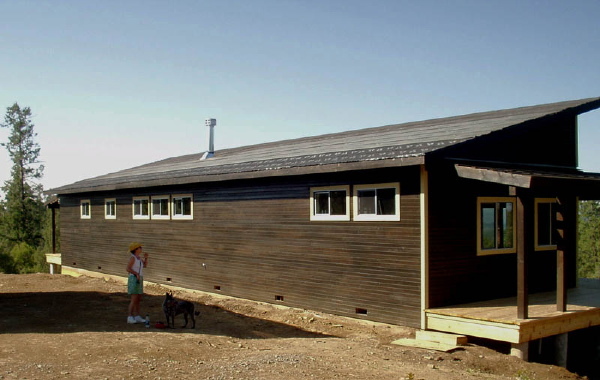 Continue reading "Prince Edward Island Plat House - complete!" It has been a few weeks since we had a look and the build is moving along at a good pace. Siding is up, windows are in, and the roof is ready to receive the metal roofing. I don't know if it's just me, but this Plat House seems to have gotten to this point fairly quickly. Its not a large house, but never the less the builder has to stay on the job to make constant progress. Its good to see. They have done an interesting mod to the porch roof, wrapping it around the sides. This will keep the walk way to the door free of snow during the winter. These look like aluminum windows on the outside, but I can't tell yet if these are aluminum clad wood, or all aluminum. The clad wood windows tend to have a wider frame so my bet is with aluminum. 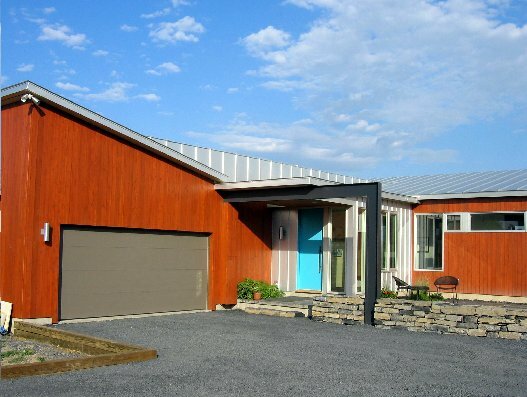 The Vermont Plat House used aluminum clad wood, but in the same clear anodized color. Our thanks to our customers who share photos of their builds. 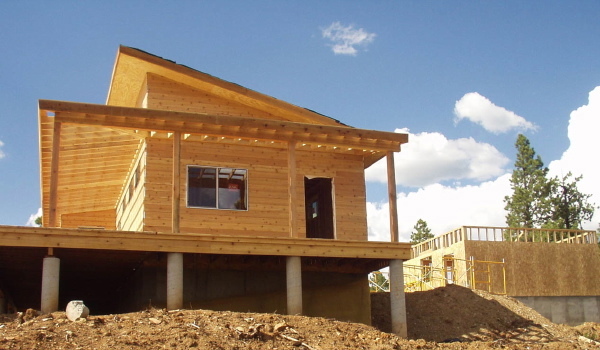 Continue reading "Colorado Plat House - moving right along"
The framing is just about complete, and the wall and roof panels are on the site. Windows are the next step. The windows may not have arrived yet, and so all we see here today is the completion of the frame. I'm going to rely on the Flickr photo stream here so I won't lengthen these entries with lots of photos. The beauty of this remote site is incredible. You can see how it comes through in taking pictures of an otherwise mundane steel frame! In the photos below you will see the garage door openings be framed out with wall girts, you will see wall panels stacked on site (wrapped from the factory to protect them), and an amazing night time sky shot which should explain the why for the observatory! Photo browser after the jump. 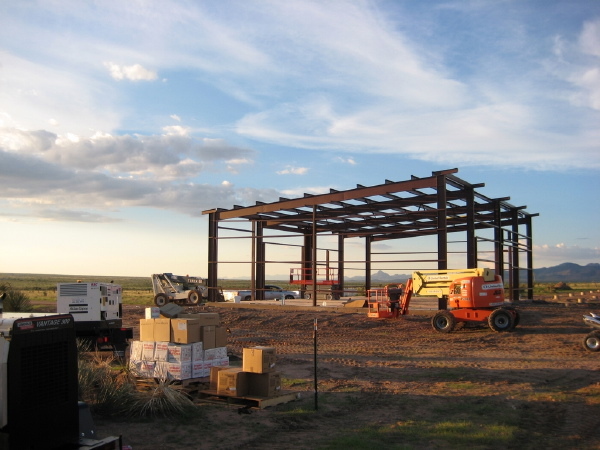 Continue reading "New Mexico EcoSteel House - day 2"
Continue reading "New Mexico EcoSteel House - Its build time!" 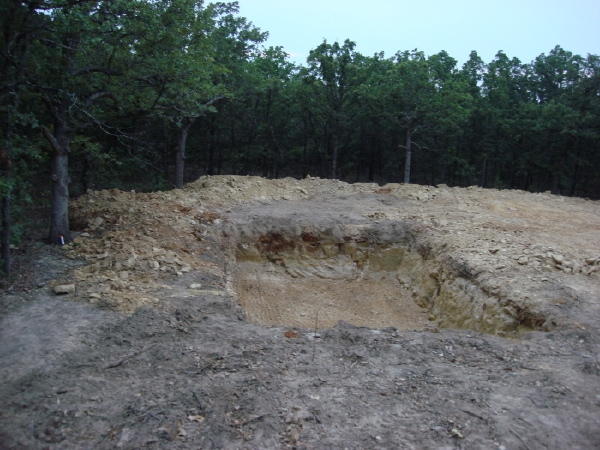 Today we have some photos of the site of a new 0385 Tray House that has just started construction in Oklahoma. Several sets of Tray House construction prints have gone out since the first house was built, but this is the first one we have gotten some feedback on since then. No knock to the Plat House, but I'm glad to see one of the other house designs getting built for a change. 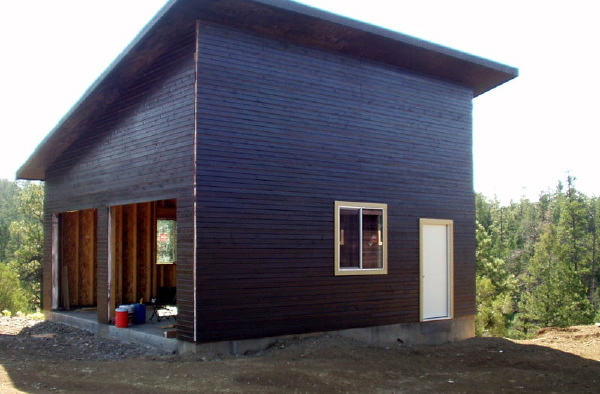 The Tray House is a great design and easy to build. It offers a less threatening face to modern adverse neighbors yet has all the same modern qualities of our other house designs. It is a wooded site in a pine forest. 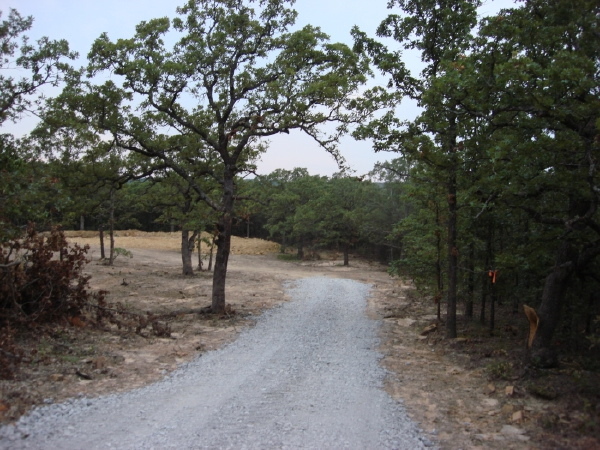 A stone drive leads up a small hill into a clearing. At the far side of the clearing there is the excavation for the basement. That photo is from the top of the log pile. This next photo helps to put the hole into some scale. A good deal of the basement is into rock - sandstone. No problem with bearing - just with digging... Our thanks to the owner for sharing their build with us. Continue reading "OK(lahoma) Tray House - intro"
I was tagged by Materialicious. What's that mean? Well, its sort of like a blogging chain letter. You post some info about yourself, and tag 4 other bloggers. In the end its a great way to discover new blogs as you follow the chain of tags, and that's what its really all about. So without further delay: Four jobs I’ve had: 1. Pumping gas at a crummy old gas station. This was two weeks in my last summer before college. A long story for a short job. To summerize, me and the other pumpers were accused of coming up short on the cash drops and were asked to fork over the bills. I told them I didn't take anything and to shove their lousy job and I spent the rest of the summer at the beach. Didn't hurt my work ethic. 2. Stock boy in a plastic knob factory. Its good to know where mundane things come from and see the people that actaully work hard to make them. 3. Draftsman for a structural engineer. A great job with a great man with a small office near my home. Too bad I was such a cocky know it all... ah well, live and learn. 4. Rod-boy on a survey crew. It was a road resurfacing project, and I got to draw up the entire thing when the field work was done. And you thought they just came out and laid down some asphalt.. Four movies I can watch over and over: 1. 2001 2. The Wrong Trousers 3. Room with a View 4. Star Wars (any episode will do, in fact most sci fi will do) Four countries I have been to: 1. Italy 2. Sweden 3. Germany 4. France Four places I’d rather be right now: 1. with my wife and daughter 2. on the bike 3. driving the Mini 4. with a book Four foods I like to eat: (shout out to Lunch) 1. Pizza from Sal’s in Merchantville - an oasis in a desert of lousy pizza. Owner Vince is from Italy by way of Brooklyn - he makes the real stuff. 2. Any pasta. 3. Universal stuffed dumpling foods that appear in all cultures like ravioli/tortolini, perogi, goyza, various dim-sum dumplings, dolmades... 4. and I'm always up for a good sandwich... Four places I have lived: 1. Troy, NY (college) 2. Rome, Italy (yeah, it was just 4 months, but it wasn't a hotel stay) 3. Philadelphia, PA (after college) 4. Merchantville, NJ (right outside Phila) Four bloggers I’m tagging: 1. Matt http://www.lettersfromthemoon.com/ 2. Lawrence http://www.lawrenceotoole.com/ 3. RYO http://theoptimahouse.blogspot.com/ 4. Don http://dbmini.us Continue reading "LamiDesign blog tagged"